It’s always a gamble dealing with resurrection. Will it work, will it just fall flat. Well I’m happy to report that the resurrection of #MonsterMash for 2018 was a resounding success. Thanks to all who participated, whether that be with a story or just retweeting and sharing the stories that were posted. The prompt was a song and I have to say that some of you embraced the prompt with open arms and used both the title and the theme to great effect. Others, like me I have to say, use of the prompt was very subtle. But at the end of the day we had a fabulous collection of 16, yeah that’s right 16, amazingly well written stories. 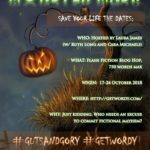 This Flash Blog Hop was just for fun but we’d like to take the opportunity to give a shout out to a few stories that really captured our attention. Miranda Kate’s tale The Summoner, was a personal favourite of mine. She captured the prompt beautifully and certainly brought the monsters to life. Eric Martell’s heartwarming tale nearly brought Cara to tears, combining monsters with love perfectly. Ruth really enjoyed the whole monsters under the bed angle from Silver James. Not only did she use the prompt well she left us with a perfect musical offering. Look out in the very near future (Yeah christmas is coming folks, batten down the hatches) for the resurrection of another special Blog Hop. Hope you will once again take part. Ooo, would love another one! But after NaNoWriMo. I’m stocked that you liked mine so much! I loved writing it. Thanks to all for hosting. And don’t forget after Christmas there is the Valentine one, the Love Bites, that was always ace too.